The cold and rain made for less than ideal conditions at the Wildcat Relays unless your name was Stephanie Lombardo. The Cheektowaga senior made the most of her surroundings, adding to her state lead in the discus with a throw of 137 feet, 9 inches to highlight performances at the 17th annual event held at the Constantino Complex at Depew High. A pair of records fell as well as Lancaster’s shot put team of Tony DeYoung, Brandon Sicurella and Colin Blair went a combined 160 feet, 5 inches. Calvin Butlak of Lake Shore bettered the mark in the 3,000 steeplechase in 9:51.3. Clarence senior Marissa Saenger looked strong in winning the 1,500 in 4:56.8. The Cheektowaga boys and the Williamsville North girls won the team titles. An especially small field included 14 boys and 14 girls teams. 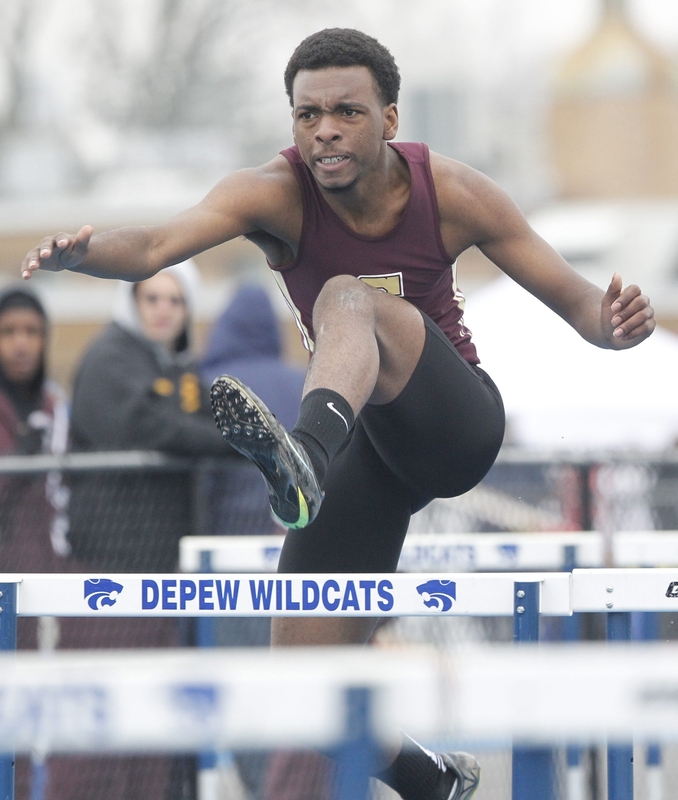 The day was also shared by the West Seneca Invitational, the Fleet Feet Buffalo Public School Invitational at All-High Stadium and the Olean Boosters Invitational. W.S. WEST INVITATIONAL: The host Indians won nine of the 18 girls events to win the title in what was the second year of the meet. Freshman Emily Marchitte won the long jump, triple jump, 100 and ran the leadoff leg of the 4x100. Canisius won the boys title in a field of 10 teams. The Crusaders went 1-2 in the 100 and 200 and won the 4x100 and the 1600. Desmond Nicholas, Charles Hornberger and Jaelin Marong led the sprinters. FLEET FEET INVITATIONAL: Two meet records fell at the sixth annual event. Hutch-Tech broke the boys 4x800 mark, running 8:39.5 and Lynda Runduage of Tech went 12.4 to set a record in the 100 meters. The Hutch-Tech boys and Williamsville South girls were team champions. Clare Losito (1,500, 3,000) and Alyssa Oviasogia (100 and 400 hurdles) were double winners for the Billies. Two undefeated teams met in the final of the Hae Jude Tournament at Silver Creek with Fredonia defeating Gowanda, 6-1. The Hillbillies improved to 6-0 while Gowanda dropped to 8-1. Winning pitcher Bailee Tarnowski scattered five hits, walked none. The run she gave up was unearned. • Wet grounds forced the cancellation of the Depew Tournament scheduled for today. Wildcats coach Dan Seelig said there are no plans to reschedule as teams need the days to play their league games. Dunkirk baseball coach Frank Jagoda picked up his 300th career victory with a 7-6 win over visiting Maple Grove. Zack Crandall had a walk-off double in the seventh after Nick Thompson set the stage with a three-run home run. Jagoda’s 300-165 record in 21 seasons includes two appearances in the state final four and five Section VI titles, the last coming in 2012. Jagoda is a 1979 Dunkirk graduate where he earned second team All-WNY honors as a junior and senior. He continued his career at UB.